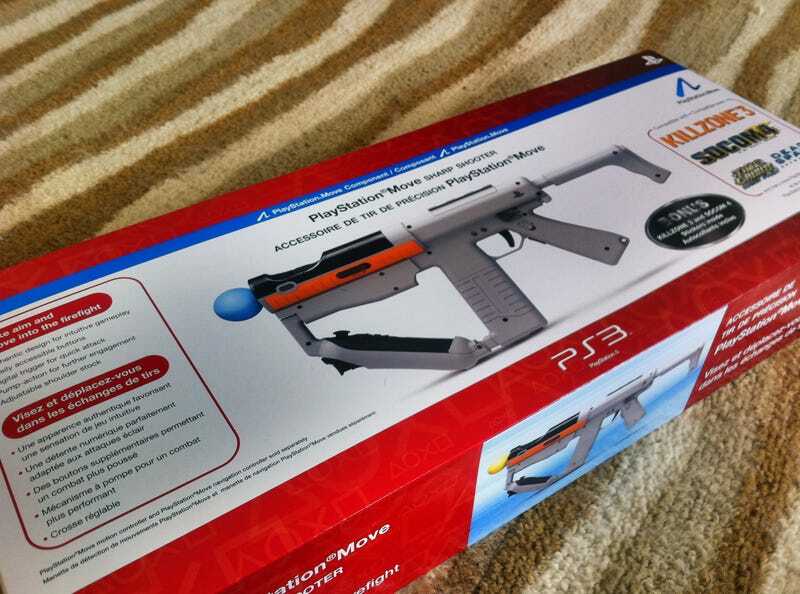 Due out later this month for $40, here's a closer look at the PS3 Move Sharpshooter. The plastic body is designed to hold Move and Navigation controllers. It's a pretty plain box. But the Sharpshooter is a slick piece of hardware. The box includes sets of SOCOM and Killzone 3 stickers. Here's a look at the Sharpshooter with the stock collapsed. That lock switch turns off the Move button. You need to pull back both release buttons to remove the Move controller. This is where you put the Move controller. The fire rate toggle can be popped off to put on either side of the gun.